The ONIX Corporation offers a full line of industrial solid fuel combustion burners rated to a maximum of 120 million Btu/hr. These cyclonic burners offer a renewable energy alternative with emissions clean enough to rival natural gas burner emissions. The staggering response time of these burners is able to control many fragile industrial operations, such as: dryers, boilers, rotary kilns, and industrial air heaters. The combustion of solid fuel yields way to a world of low-cost, environmentally-sound, renewable carbon-neutral fuels. Existing fossil fuel burners can be retrofitted to enable industries to burn gas, liquid, or solid fuels. Cyclonic furnaces have become a major alternative to conventional burners. Applications include both large scale utility boilers and industrial processes where renewable energy can be recovered profitably. The ONIX Corporation Series Solid Fuel Burner is operated by the method of “cyclonic combustion.” In cyclonic combustion, the burning occurs at a positive pressure rather than the slight negative pressure associated with most suspension fired solid fuel systems. These burners are capable of delivering from 400,000 to 120 MM Btu per hour, and can achieve temperatures of 2,000°F while saving money on every Btu used. Our full line of Solid Fuel Burners have many industrial applications including retrofitting natural gas burners, dryer heat source, heat for kilns, heat source for boilers, power generation systems as well as industrial space heating. The ONIX Corporation prides itself on meeting and exceeding Local, State, and Federal Air Quality Standards. We have stack testing performance data (conducted in the presence of the EPA) documenting outstanding performance in the PM/PM10, SOx, NOx, and CO categories. There are hundreds of ONIX Corporation Solid Fuel Burners presently in operation providing trillions of Btus of clean renewable energy for a fraction of the cost of fossil fuels. Many companies experience a one-year return on investment while helping to thwart climate change. Cyclonic combustion occurs in specially designed cylindrical reactors which discharge hot gaseous combustion products directly into the downstream process. Pulverized wood is blown into the cyclonic burner where it oxidizes immediately. Centrifugal action forces the unburned particles toward the cylindrical wall of the burner where char oxidation occurs. Very high turbulence is generated in the cyclonic burner and char oxidation occurs within milliseconds. Combustion intensity in cyclonic burners is considerably higher than combustion intensity in conventional wood suspension fired furnaces. The vigor of the cyclonic action forces the wood particles to the burner wall, facilitating not only rapid combustion but also solid product classification. Cyclonic burners typically remove 99% of the solid products of combustion. 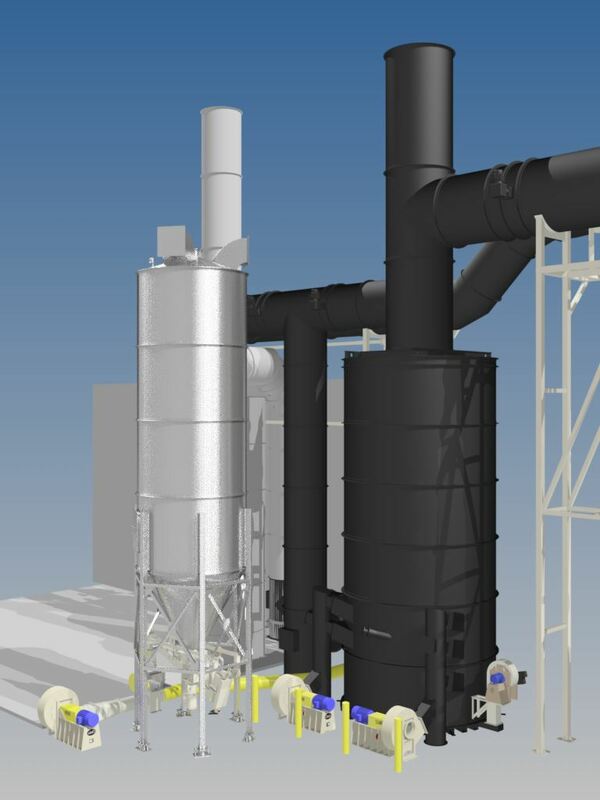 These solid products of combustion, which are too small to be visible, are entrained into the air stream and then enter the downstream process where they are removed as fly ash by a particulate control system. This solid fuel system is designed for a wood fuel having a “normal size distribution” with a 1/4″ maximum particle size, a lower heating value of 7,500 Btu/lb or greater, an ash content of 6% or less, a moisture content of 10% or less, and a consistent density of 10-25 pounds per cubic foot. The ONIX Corporation offers many options for the delivery of solid fuel to the burner. The ONIX Corporation’s fuel tank delivery system stores fuel in anti-bridging fuel tank mounted on load cells. These load cells track fuel consumption and display fuel level in percent full through the Onix-OS©. 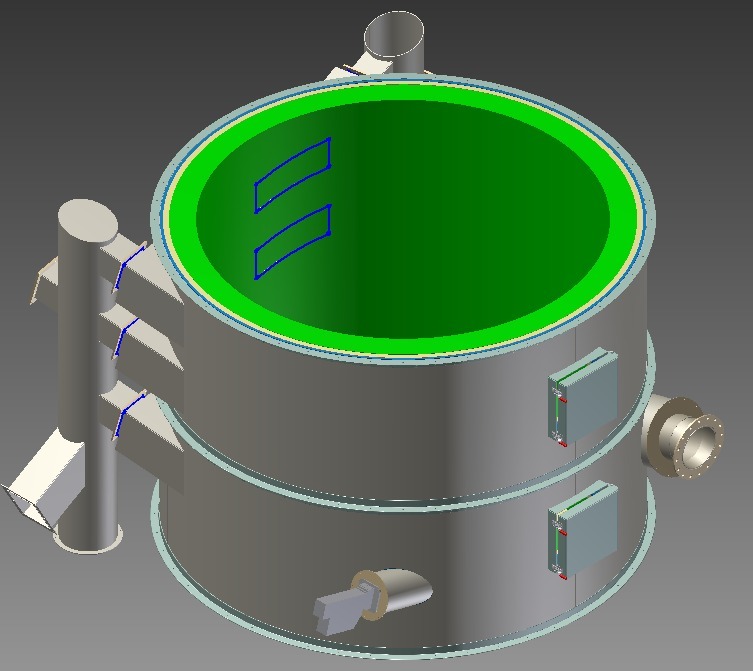 The ONIX Corporation’s tank delivery system has a high level sensor to prevent tank over-filling. 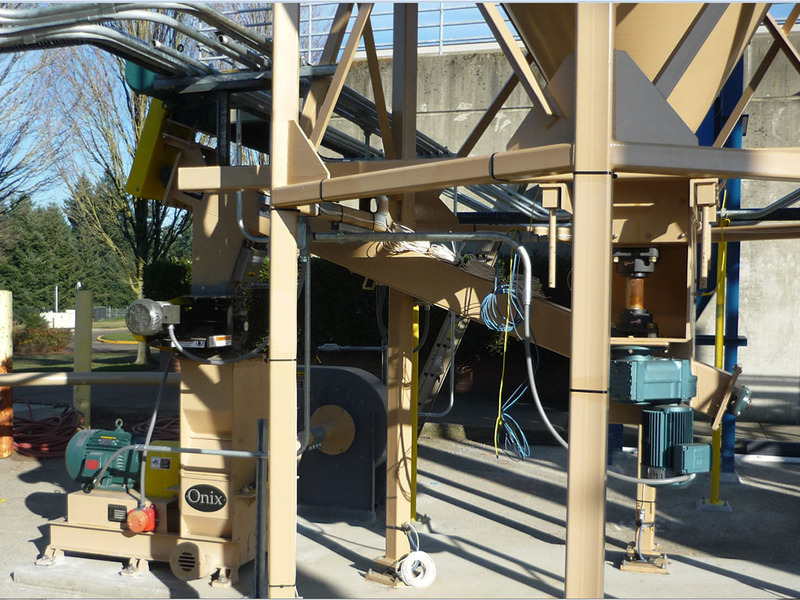 The ONIX Corporation’s hopper feed system has an anti-bridging fuel hopper that is loaded via front end loader or conveyor. These hoppers are located in the fuel receiving, storage and handling warehouse at the client’s facility. The hopper feed system can also be equipped with load cells. The ONIX Corporation’s fuel hoppers have a low level sensor that sends an alert signal to the Onix-OS© to alert operators to low tank level. The fuel from either system is fed on demand to the burner via a command signal from the Onix-OS©. The fuel is metered, pulverized, fluidized, and pneumatically delivered to the solid fuel burner for instant combustion. 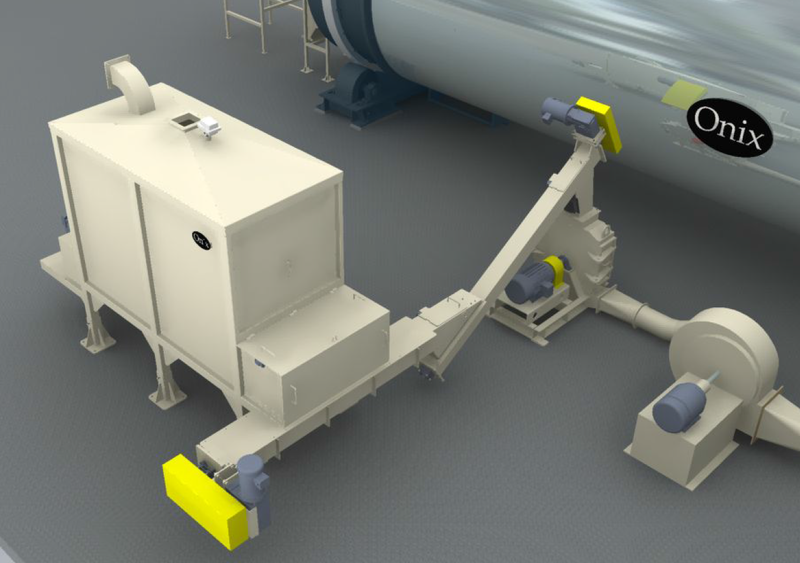 The fuel delivery system can be located up to 400 feet from the solid fuel burner combustion vessel. The fuel delivery pipe can be routed overhead or underground to favor customer installation conditions. etc. yielding fuel costs of below $1.00/MM Btu.